Private parking within this exclusive gated development. Just to be absolutely clear if your idea of fun is drinking as much as you can with your mates this isn`t the place for you. Come relax, have a good time. Just a great location for all ages. A haven for walking, cycling, golf and within easy reach of Glasgow and Edinburgh. Stirling and Perth close at hand a perfect base for exploring the whole of Scotland. Perfect for family get togethers. Large 7 seater hot tub to relax in on summer or cold winter nights. Exclusive gated development. Right on the edge of Gleneagles Hotel golf resort and Auchterarder golf club. Other facilities walking, cycling, horse riding, tennis, shooting even parachuting ! Safari park 20mins away. Lots for all the family. One of the bedrooms and bathroom on the ground floor. All rooms can be superking or twin. Hot tub included for your enjoyment. Underfloor heating downstairs and traditional radiators upstairs all for ease of use. Lovely quality white cotton linen. Let us know how you wish the bedrooms made up (all can be twin or superking) and we will have it done for your arrival. 2 reserved parking spaces with more available. All in secure gated development. Garage available to store your bikes and golf clubs. Plenty of lovely quality bath sheets and hand towels , 1 of each for everyone. Lovely open plan living room, dining room. Dining table with lighting. Quality leather couches, coffee and side tables. 60" plasma tv complete with sky and cable tv. Wi-Fi throughout house with simple open connection. Ipod and smart phone docking sounds. Selection of spices. Coffee, sugar, sweetener, tea provided. Quality white dishes, cups, mugs etc. Vilroy and Boch cutlery. Everything you could need and plenty for everyone. 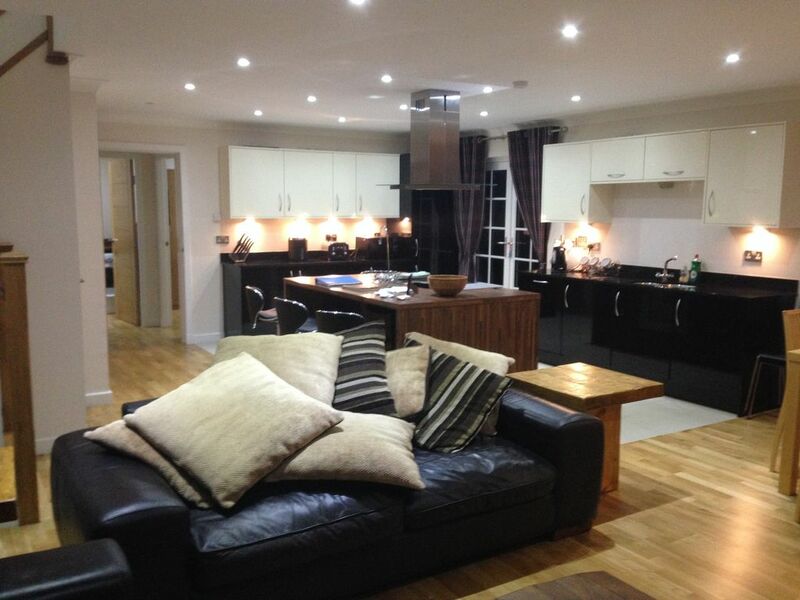 Large open plan kitchen, island unit with induction hob and oven, freezer, fridge, dishwasher, microwave. french doors to decking and garden area. Quality worksurfaces and all smeg appliances. Fully equiped for the keen chef or easy to use heat me up. Bring your own and the system should be able to play it. Some toys for the younger ones. Nice quiet fenced garden with decked area, table and seating. Barbecue and large hot tub. The ski resort of Aviemore is about 2 hours away. Across the road to Gleneagles Hotel courses (3 of + 9 hole + pitch & put, driving range and golf academy) play the Ryder Cup course, famous Kings Course or delightful Queens Course, all a stiff challenge. Auchterarder Golf Club (some say the third best course in the area) Great base for exploring the rest of Scotland with easy travel to St Andrews and Carnoustie. Suitable for disabled. Reserved parking at front door, bedroom 4 is on ground level as is bathroom 3 which has on the level shower. Path to front door from parking (no steps). Open kitchen with large work areas also open to dinning and lounge areas. Large hot tub with jets, blowers LED lighting. Large ice bucket on hand all you kneed to relax and enjoy. Notes on accommodation: Everything done to ensure a happy stay for guests. Welcome pack of essentials can be provided. Details of local activities provided. Local menus provided. Taxi numbers provided. Outside: French doors from kitchen to on the level decking area and low maintenance rear garden complete with gas barbecue and large hot tub. Utility Room: Sink, washer and seperate dryer. Full laundry facilities including ironing board etc. Cleaning / Towels / Linen / Maid service: On site meet and greet. Quality linen and towels included. Can accommodate late arrival times. Very generous welcome pack. Comfortable beds & well equipped kitchen. Owner very friendly & helpful. Luxurious and well kept cottage perfect for golf groups and a family getaway. Will definitely be back - a lovely quiet location. An excellent and comfortable condo. Great for three couples. Owner very accommodating and available. Gleneagles Golf courses, Auchterarder Golf Club, Carnoustie, St Andrewa Courses. No beach here. You are right in the middle of Scotland. A great location to explore the whole of the country. Glasgow and Edinburgh airports about one hour away. Village of Auchterarder 5 mins walk. Use the road legal golf buggy and it`s even closer. Lovely town of Perth is 12 miles away. Glasgow 45 miles, Edinburgh 45 miles. All facilities are available in Auchterarder (5 mins on foot). Pubs, cafe, restaurants, all banks, post office, medical, dentist, chemist, supermarkets. Local horse riding, shooting, fishing, walking, bike rides, even parachuting including tandem freefall. Booking Notes: Give me a call and we can sort something out 07831499846 25% deposit required on reservation (property is very popular so this is non returnable) Balance of full payment 4 weeks before visit (again it is non returnable) Credit Card and Debit Card payments accepted Paypal is acceptable as is cheque or bank transfer. Changeover Day: Changeover day is flexible. Call to check the price. Arrival after 3.00pm please, departure by 10.30 Notes on prices: If in doubt drop me a line and ask. Three day breaks are @5/7ths of weekly rate.